At the Texas Tribune Festival in Austin this weekend, policymakers were at center stage, with several West Texas issues in the spotlight. 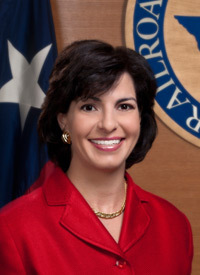 Christi Craddick, a native of Midland, serves on the Texas Railroad Commission. KRTS reporter Graham Dickie asked her about the Trans Pecos Pipeline, the proposed natural gas route from the Permian Basin through the Big Bend into Mexico. “Lawsuit, basically?” asked the reporter. “Lawsuit, yes,” the Commissioner answered. Graham Dickie contributed to this report. This entry was posted in KRTS News and tagged Texas Railroad Commissioner, Trans Pecos Pipeline. Bookmark the permalink.